On November 23-25, Maceió hosted the VIII CB27 National Conference. The conference promoted the dialogue among managers, including a technical visit at the end of the event. Between 2015 and 2016, relevant global agreements on sustainability have been reached among nations, with instances of participation of local governments in their processes of debate and negotiation, namely: the Sendai Framework on Disaster Risk Reduction; the Sustainable Development Goals; Funding for Development; the Paris Agreement; and the New Urban Agenda, in addition to the previously agreed Aichi biodiversity targets. Another important cycle also came to an end for the CB27 in 2016. 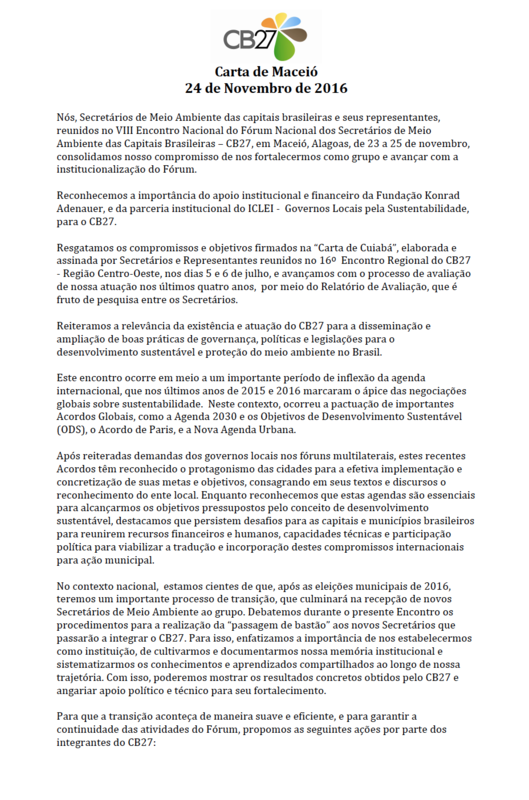 Together with the institutionalization of the Forum, the continuity and relevance of CB27's actions will depend on the success of the transition process and leadership capacity in avant-garde agendas. This context was the backdrop of the Secretaries of the Environment of the Brazilian Capital Cities meeting in Maceió. They discussed the main challenges of the new international agendas for cities and the CB27 transition in 2017. CB27 is inspired by the C-40 formed by mayors of the largest cities in the world and that establishes an exchange of experiences and forms of partnerships that collaborate with the execution of sustainable practices in cities around the world.